In this essay, I argue that animation has the same potential as a structuring trope in the age of digital media and the rise of creative industries that performance had in the age of broadcast media and the rise of the service industry. The article is tempting: if animation is the new performance, could Animation Studies become as accepted in academia as Performance Studies? Silvio defines animation very broadly, including cosplay and puppetry within the realm of the animated. As performance capture and digital puppetry become more prevalent, this wider definition, beyond the focus on individual frames, seems inevitable. My research is looking at places where animation and performance overlap. Investigating the history of animation and live performance, I begin to wonder what animation and animation studies would be like now if McKay’s Gertie, instead of Disney’s Mickey, had been the dominant character in American popular culture? 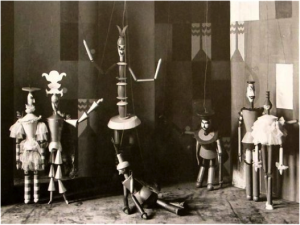 What if animation had kept its close ties to live performance, to the one-person-show, the vaudeville spectacle, instead becoming known primarily as a mass-market-aimed industrial process, at least in the United States’ public consciousness? Or, what if Dada artists Emmy Hennings and Sophie Tauber-Arp had met up with Lotte Reiniger or Ladislav Starevich? They could have used stop-motion animation to bring to life her amazing puppets, and performed with them at the Cabaret Voltaire. Would animation have been an integral part of art history? It’s only now, that William Kentridge and others have broken a barrier that museums and galleries are increasingly including animation alongside painting and sculpture. Why has it taken one hundred years for the combination of live performance and animation to flourish, as it seems to be now? 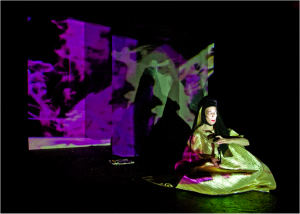 Is it just that advances in projection and digital manipulation of images, and more accessible and inexpensive technologies have led to a boom in these mixed-media performances? Or does it represent a shift in definitions, and a blurring of the sharp distinction between the live and the pre-recorded? I’m excited by the work of contemporary artists with a foot in both worlds – live and animated. I have written more extensively about three of these artists (Kathy Rose, Miwa Matreyek, and Eva Hall) and I am interested in crossovers between animation and performance. In my own artistic practice, I am helping develop a digital puppet or real-time animation system that would capture live movement of a hinged cut-out animal figure, and working on immersive animation projects integrating live components. Here on this blog, I thought it would be interesting to curate some links to videos online that I find intriguing, in the hope of continuing this conversation about expanding animation beyond the screen. Here are just a few examples of how projection is being used to create art and events that blend the live and the animated. Miwa Matreyek creates poetic and evocative work with her shadow silhouette closely choreographed with collage animation. With a grant from Creative Capital she is following the success of her two previous performance pieces with a new work, “This World Made Itself” that premieres October 31 at the Wexner Center for the Arts. One piece, “Fuma-Kai,” follows dancers/characters as they run in place while stylized backgrounds go by, like a living side-scroller videogame. Another piece, “Primitive” uses a very effective minimal palette of black, white, and hints of red and simple shapes to play with shape and scale. Multimedia performance artist a dandypunk’s website welcomes you to the “New Weird.” With a neo-Victorian steampunk aesthetic, his Vimeo Staff Pick “Alchemy of Light” uses projection mapping to stage a dance between the performer and various animated projections of his creative imagination, including graffiti, a 3-d miniature robot, and a simple sketchy character in a birthday hat. A dandypunk himself flips and contorts himself like an animated character, and throws projected light across the stage. Eva Hall was influenced by this interdisciplinary Kansas City-based performance ensemble. They combine animated visual effects with circus arts, aerieal acrobatics, dance, music and fashion. Through a simple illusion (a live projection turned 90 degrees), Leo appears to walk up walls, hang suspended in mid-aire, and swim with animated sea creatures. London-based artist Birgitta Hosea works in expanded animation, using a variety of media to investigate “hybrid forms of practice in which animation meets live presence.” In one project, Dog Betty, she dressed up as the pre-human Betty Boop character, and went about daily activities. 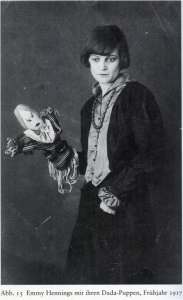 In “Medium” she enacts a séance with projected ghosts. In her 2008 performance piece “Out There in the Dark,” sound-clips from the film noir classic Sunset Boulevard accompany a projected blinking doll’s head that casts an eerie image on a bag over the artist’s head. She also performed this piece as a peep show. This is by no means a thorough list. I welcome other examples, as I am sure with new portable projectors experimentation is happening around the world. Though these projects show a variety of approaches, styles, and aesthetic goals, all share an interest in creating unique experiences by mixing real-time, live, bodily performance with animated, pre-recorded, projected images to suggest alternative realities. It is the ability to lead to this liminal state, to an alternative subjectivity, which makes the blend of performance and animation so appealing. Silvio, Teri. “Animation: The New Performance?” Journal of Linguistic Anthropology, 20, 2 (2010): 422-438. Oliver, Mary, “Me-but-not-me: Teaching the digital double.” International Journal of Performance Art and Digital Media, 8, 2 (2012): 189-204. Lynn Tomlinson is investigating expanded animation projects as a scholar, curator, and artist, reflecting her interest hybrid art forms and interdisciplinary practice. Current projects include fulldome experimentation, digital puppetry, projection mapping, and interdisciplinary collaborations in performing and media arts. Her clay-on-glass animated shorts have been screened in festivals internationally and aired on children’s public television, MTV, and Sesame Street. She has taught at the University of the Arts, Maryland Institute College of Art, Delaware College of Art and Design, University of Maryland Baltimore County, Stockton State College, and Cornell University. Tomlinson currently teaches at Towson University in Maryland, where she is also working on an interdisciplinary MFA. Fascinating! A thought-provoking (and sometimes slightly unsettling) collection of videos. Miwa Matreyek sent me this public link to her new piece, “This World Made Itself,” which she is updating as this work-in-progress nears completion. I hear she will be presenting it live in Baltimore this spring at the Theatre Project as part of the QuestFest visual theatre festival. That’s where I saw her performance in the spring of 2012, and was inspired to begin my investigation into the crossover between animation and performance. My name is Irenia. I am currently doing an MA in animation and Digital Film, and my thesis is going to be about live performance and animation. Your article has helped me a lot with my research. I was wondering, since you are investigating the subject, if perhaps you are able to give me some advices, regarding research and documentation about it! I am currently writing about the background of my project and I am having a hard time finding the first uses of live performance and animation. Thank you, this post has been very useful! I’m writing a report about the versatility of animation and how all the visual arts interconnect to each others and you gave me really a lot of material to have a look at.